« The return of GrowFest! There was plenty at GrowFest! to feed your body, mind and soul. Maybe the best part was all the delicious locavore treats. You could seriously nibble your way from one end of the festival to the other and leave with a full belly. Art Friedrich answers questions about tropical fruit. Chef Jon Gambino makes pizza the way the old Italian guys taught him. 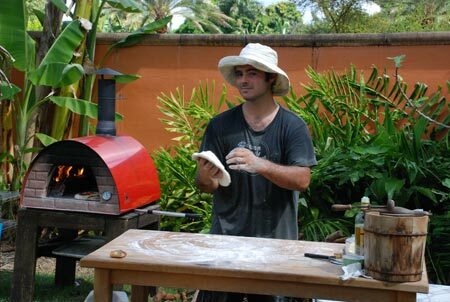 Delicious aromas of wood fired pizza — yes, pizza! — wafted through the festival. Chef Jon Gabino of Three Sisters Farm brought his pizza oven, pizza dough, and carefully stacked wood next to his work table. Jon’s hands danced with circles of dough, and finished pizzas flew out of the oven as fast as he could make them. Rachael Middleton offered roselle and lemongrass teas and jaboticaba sorbet to complete the meal. 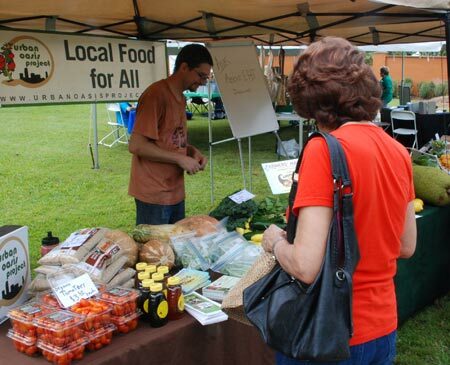 Pizza is one of many vegetarian dishes that Three Sisters Farm offers on their Saturday night Farm Meal. Nearly everything on the menu is super local, sourced from the farm or growers nearby. Make your reservations online here. 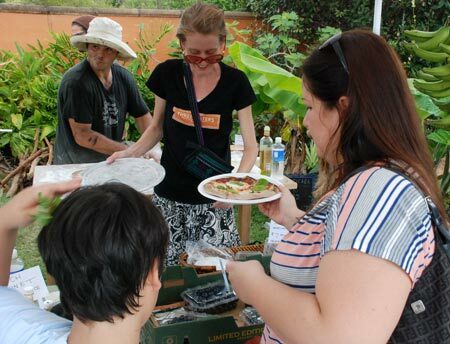 Jon Gambino and Rachael Middleton serve up pizza while it’s hot. Beekeeper Rigo Delaportilla tells it like it is. At the demo tent, there was lots of information to feed your mind. 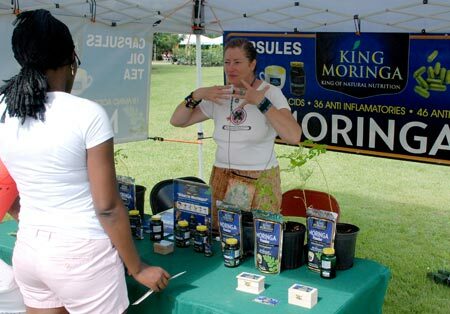 Workshops were scheduled through both days on many gardening topics. 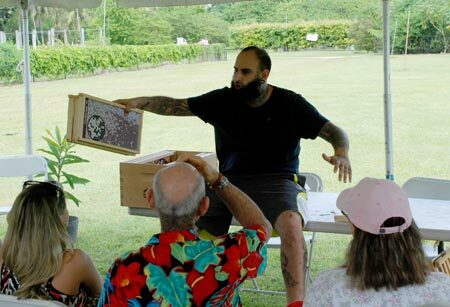 Urban beekeeper Rigo De La Portilla spoke on backyard beekeeping. He is one of several local beekeepers who captures swarms and home infestations without killing bees. Other popular talks were on plant propagation, growing mangoes, vermicomposting (using red wiggler worms to make compost), raising chickens, and setting up a rain barrel. No festival is complete with without music. This year, music students from Robert Morgan Educational Center’s string quartet performed on Saturday. 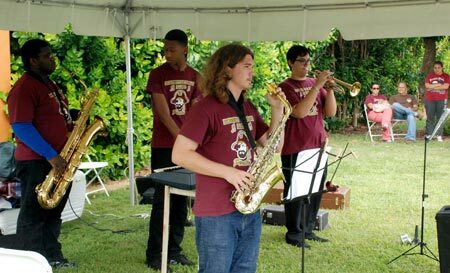 They had so much fun last year they came back again, and brought the jazz combo with them. 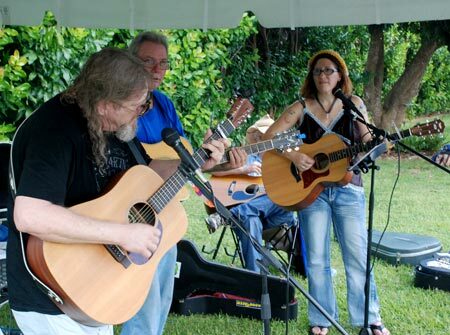 On Sunday, members of the South Florida Bluegrass Society livened things up with their old timey tunes. 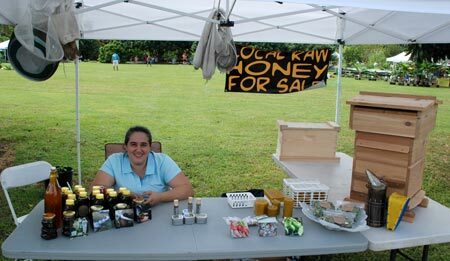 Eliza Delaportilla with local raw honey, beeswax candles, and some tools of the trade. 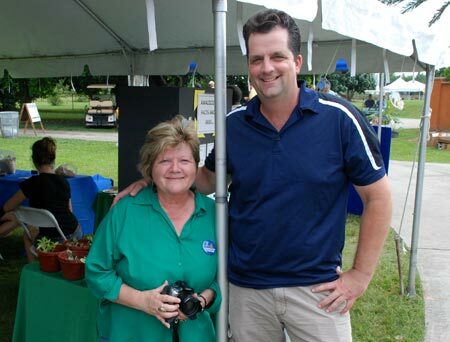 Teresa Olczyk and Jeff Wasielewsky from the UF/IFAS Extension office. 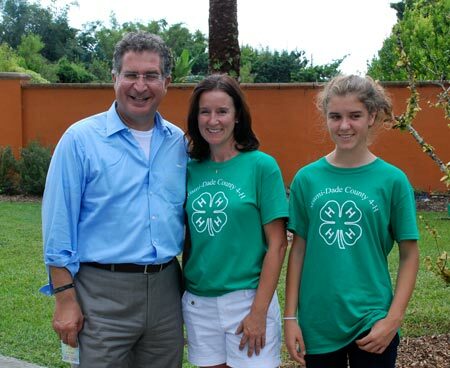 Congressman Joe Garcia takes a picture with 4-H members. The celebrity sighting, as it were, came on Sunday afternoon. As I was hanging out by the Extension tent, Congressman Joe Garcia, accompanied by Kevin Chambliss, sauntered into the park and started greeted people. Everybody ran to take a picture with the congressman. You know that your event is on the map when local politicians come to visit! GrowFest! 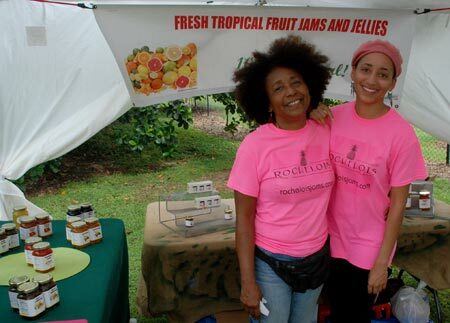 will be back at the Fruit and Spice Park next year, bigger and better. See you there! 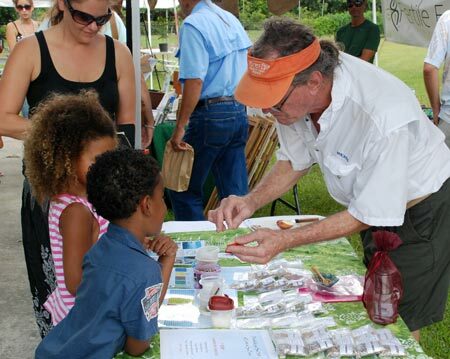 Tom from Florida Keys Sea Salt offers a sampling of salt on an apple slice. 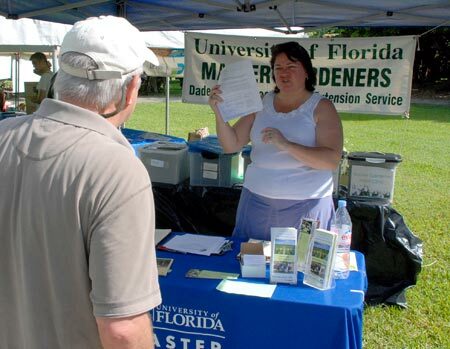 Master Gardeners were on hand to solve problems. 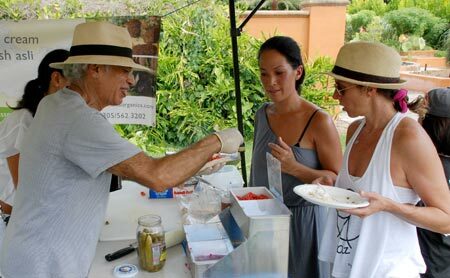 Hani Khouri builds a hot, fresh falafel for hungry customers. His special hot sauce made from ghost and Thai peppers was amazing! 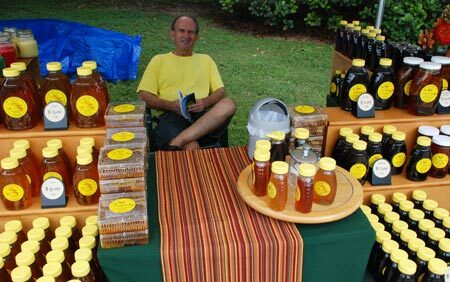 Miguel Bode brought his wide assortment of honey.